On to the card and I'll come back to Galiano later in the post. My friend Bonnie is part of the Merry Monday DT and always provides such wonderful inspiration. I've just started making Christmas cards the past few weeks, and when I saw Bonnie's gorgeous cards, I had to join in. The card above is for the latest Merry Monday challenge - Anything Goes that runs all July long. Thanks for inspiring Bonnie! I mentioned previously that the craft store where I used to get my copper went out of business, so I researched and found a supplier in the U.S. Basic Copper is based in Illinois. They have many copper thicknesses to choose from. I bought the 5ml ... which is what I used before. I have to tell you that their copper was a little different that my previous copper. It's a little more flexible, so it will take me a little time to get used to heating it. But, for those who have asked where I get my copper (most of you are from the U.S.) ... this supplier is worth checking out. Again 5ml copper sheets is that you want. I can cut with my rotary cutter (although I'm sure if I did a lot it would dull the blade quickly), it cuts easily with my punches from SU! ... and I used it today with a die-cut from My Favorite Things. I ran it back and forth a few times and it didn't completely break free, but was easy enough to push out with my hands (be careful, the copper edges are sharp). For the small pieces, I used my scissors to cut into the outline of the die to loosen. I heated the copper with my butane torch until it changed colors. Once cooled, I die-cut the ornament and hanger. I cut extra layers of the ornament from white and glued them onto the copper for a backing ... this made the ornament thick. I added a strip of copper down the left side, topped with a strip of DP. I did the same for the inside of the card, but changed it to run horizontal at the bottom. I glued three pine branches together. I cut a small piece of copper wire and used my pliers to form a hook to hang the ornament. I glued the branches onto the card front and popped up the ornament for more dimension. Galiano Island is one of the Gulf Islands located between B.C. 's mainland and Vancouver Island. We love the island ... and have been going there for the past five years or more. It is one of the "quiet" islands that has been preserved for it's natural beauty. It is also home to many talented B.C. artists. While we were there, we visited our three favorite artist's studios. Jer bought two glass pieces and I bought a pottery vase --- gorgeous!!! Lots of wildlife, not much development (no chain stores of any kind, including restaurants) - it is the perfect place to rest, relax and get away from all the every-day stresses of life - ahhhhh! The "cabin" (2 bedroom house) is right on Active Pass ... a narrow channel between two of the islands. Sorry the picture is so small, but I tried to capture the ships as they passed through. There are actually three ferries in the Pass for this picture ... always something to watch! This picture was taken from our deck. We had the most beautiful weather when we were there! We saw lots of seals, swallows, butterfly, deer, ravens, and dragonflies ... but no whales this time. We've been lucky enough to see whales four times while visiting. Gord and Jer ... patiently waiting for me to take the picture so they could chow-down on their yummy French Toast, Vanilla Yogurt and Plums. You'll notice we always had binoculars close-by on the deck - lots to see! Kunamokst is a mural mosiac done by 200 artist's from Canada, creating 231 panels. It's an amazing piece of artistry, each individual panel a work-of-art in itself. The mural is displayed at the Galiano Inn and Spa. Here's a close-up ... or click on the link to check it out. One more picture ... this is a Butterfly Bush in the backyard of our cabin (fabulous garden). I was sitting on the back deck in the shade, admiring the garden when I noticed a large (3" across) butterfly land on the bush. Then I noticed that there were at least eight ... probably lots more as I could only see the one side of the bush from where I was sitting. I ran and got my camera and managed to get a good picture of one ... you'll see part of a second butterfly on the right hand side of the picture. 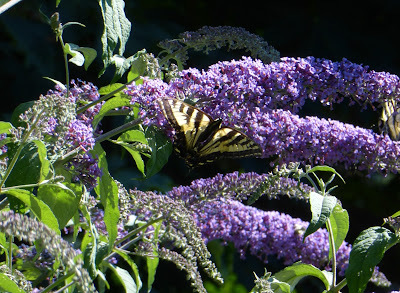 The colors aren't true because it was very sunny ... the butterfly was very bright yellow. Labels: cheery lynn, christmas, copper, my favorite things, Stampin' Up! This copper ornament is AWESOME! And as always your layout is perfect to show it off! You always inspire me, Loll. Thanks for sharing this with us at Merry Monday! And thanks for sharing these beautiful pictures. It looks like a wonderful place to visit. I'm glad you had a good, restful time! Firstly I want to say how much I LOVE your card! I'm always amazed at the effect copper has as a focal point, and it is truly stunning and perfect with your design! I remembered that you had mentioned you would be away for a few days, so I wasn't worried...I DID MISS you, though! And not just because you're an incredible artist, but because you're a sweet one, as well! So glad you had a restful break...your pictures are beautiful! Gorgeous card and glad all is well, and also glad that you had a restful time away, and your pictures are so pretty, looks like a lovely place to vacation, very similar to the place in NY state where we go . Glad you had such a nice time, I really enjoyed looking at your pictures. Whales are one thing I have not had the pleasure of seeing, maybe one of these days we will take a ride up to New England and go whale watching, have seen some dolphins, and would also love to see some seals. Oh well, take care and thanks for sharing with us. Loved your copper ornament card. Gorgeous. Enjoyed seeing your fabulous pics too. Appears you had a most scenic getaway. So happy you had good weather, and were able to relax a bit. 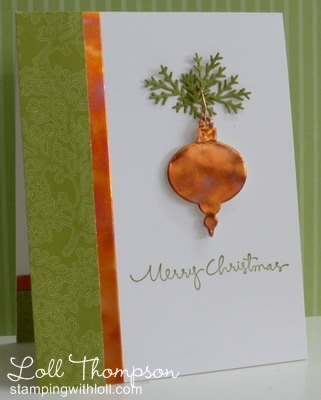 Fabulous card, love the copper ornament (I have some copper sheets not used yet!mmmmmm also have the MS Punch. Beautiful! I must dig out the copper I have and play with heating it. A perfect CAS card. Thanks for posting the photos from Galiano. I've been there and also found it very restful. What a lovely spot you stay in! Beautiful ornament-what a lovely effect. Simply gorgeous card Loll - love the effect of the heated copper. Your mini break sounds and looks wonderful. All the wildlife and no chain stores - heaven. Thanks for sharing the photos - that mosaic mural is stunning. wow Loll, I love this-copper for cards-fabulous. It is perfect for a Xmas card! Beautiful card Loll. I don't work with copper because it is so sharp. I cut easily. What a grand vacation place. It just looks like rest and relaxation and beauty all around. Wonderful and glad you had a good time. Welcome back...we all missed you my friend! Beautiful card Loll I love the bronzing. great Holiday pics too, that sea looks wonderful and just the idea spot for hubby to relax..hmm!! Love the copper bauble, Loll! Galiano Island looks like a fabulous place to recharge the batteries! Wow, what a stunning card! I was all set to run and buy some copper...then I get to the propane torch business.........oh dear, I think I might end up burning the house down! Not sure if I can be trusted with a propane torch in my craft room....I have a hard enough time unplugging the glue gun! Gorgeous results though! Thanks for playing with us at Merry Monday! Oh, my, where to start, Lolly! 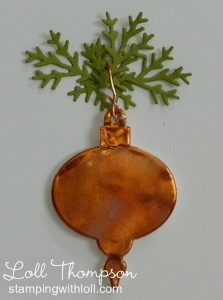 Your copper ornament is a gift, pure and simple. A card and gift in one for the lucky recipient! I'm overwhelmed by your talent!! Thank you for sharing the pictures. Holy moly, but that looks like paradise! (Handsome hubs and son, too, BTW!) Is it hard to get reservations there? It's been years and years since the Mister and I have been up that way to Vancouver Island and (along with Nova Scotia) it holds so many wonderful memories for us. I'm thinking it's time we ventured north and checked out Galiano Island! Lastly, I just saw that same butterfly on the sidewalk at work and took a picture. It's on my long list of Card Ideas ... someday. But it was stunning - looked like a batman design on it!